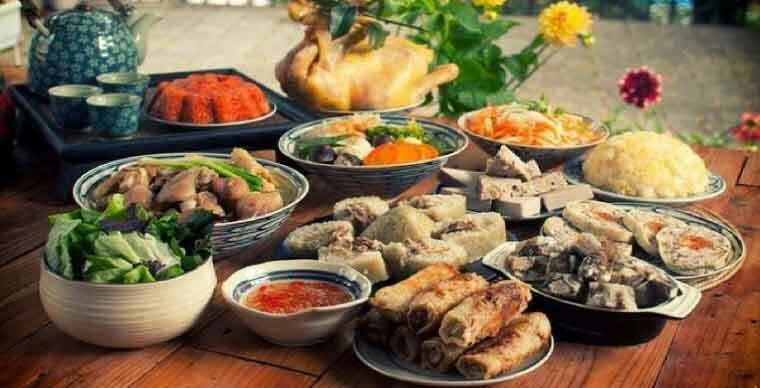 If someone asked me, what is the most happening activity during the traditional New Year days, I would not hesitate to answer that, it is when preparing the traditional tray.Vietnamese culture, which is known to have a diversity of ethnic groups, among regions, so is New Year's cuisine. But it is a diversity in unity in the way of processing in dishes but they are all towards the traditional cultural values of the land country. 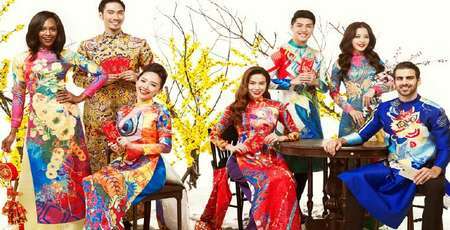 Along the Fatherland during Tet holiday, it is not difficult for us to encounter different culinary paintings among South - Central - North regions. 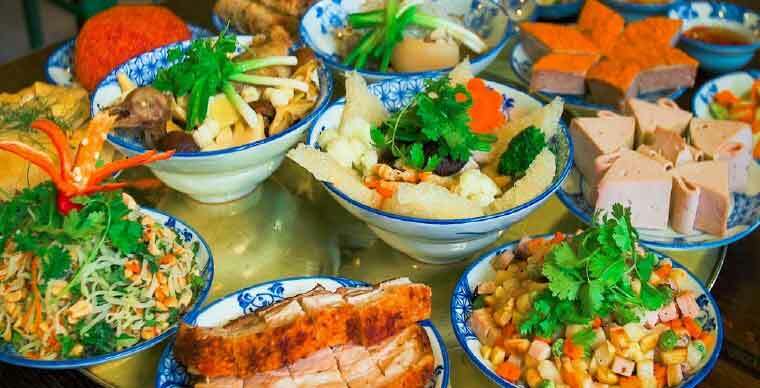 Tet Feast in the North is displayed quite well with a lot of dishes such as thit dong (pork jelly), boiled chicken, banh chung, banh tet etc. 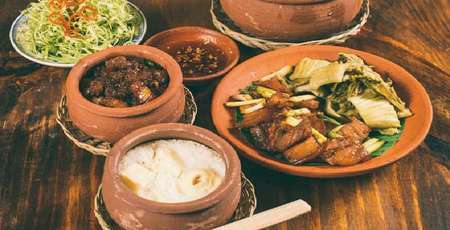 In the Central region, the indispensable dishes are pickled vegetables, banh chung, banh tet, pickled pork, etc. The South also has many special dishes such as bitter melon stuffed with meat, Vietnamese caramelized pork with coconut water, etc. This difference comes from culture and objective factors related to geography, climate, local specialities etc. Although there are many differences, the Vietnamese New Year cuisines are still unified. For example, green and red are chosen as the main colours because they represent luck and good fortunes. The tray is usually consistent with 4 plates - 4 dishes or 6 to 8 plates - 8 dishes representing four seasons, preventing unfortunate signsin the new year. In general, the Vietnamese New Year tray is a symbol of prosperity, fullness and expression of the sincere heart that children and grandchildren want to express their gratitude to their grandparents and ancestors. The unification in the culinary day of Vietnamese New Year is also reflected in the observance of the world view of the Eastern people, especially the layout of the Tet fruit tray including five different fruits. The five fruits represent the Five Elements, expressing the owner's wishes for a warm, prosperous, and favourable life according to the nature and rationality of the law of heaven and earth. 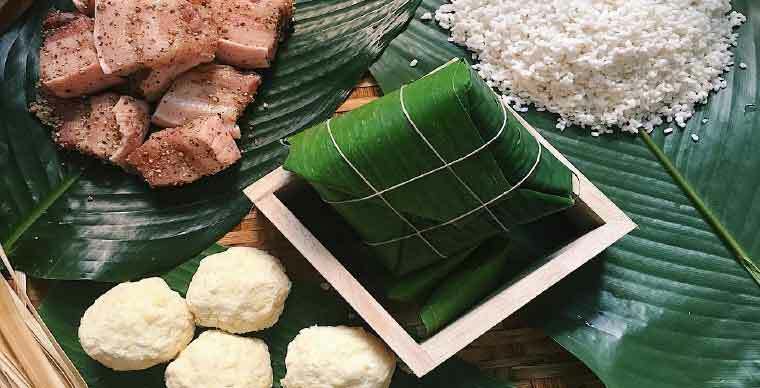 In addition, many Vietnamese New Year dishes are also associated with meaningful stories and legends, reflecting the cultural traditions of long-time folk traditions of Vietnamese people. Banh chung: Associated with the fact that Lang Lieu made a banh chung and banh day to offer to King Hung. 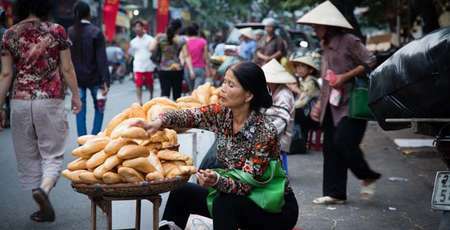 Square banh chung symbolizes earth, peacefulness; the cakes made from glutinous rice, pork, mung beans packed together. These are the quintessence of Vietnamese rice and agricultural culture since the ancient times, symbolizing a prosperous and full life. Thit dong ( Pork jelly): The blend of raw materials expressing the desire to link people together, clear layers of jelly mean a new year with lots of luck and convenience. 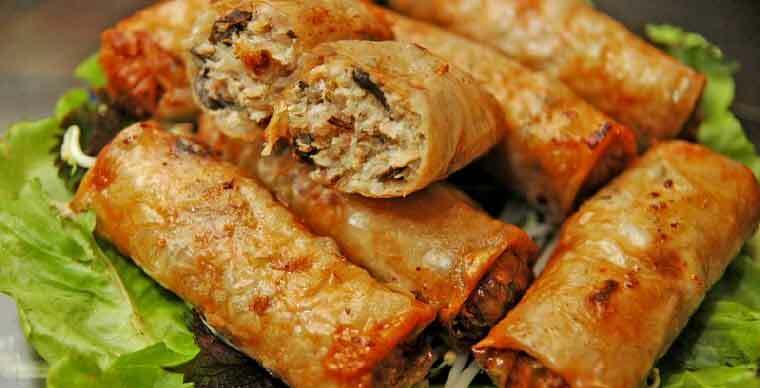 Spring rolls are very familiar in the tray of Tet. If you ask me to name the most sophisticated processed foods, I will definitely bring fried rolls to the top of the table. This dish is the perfect example for the elite in Vietnamese cuisine. Boiled chicken: Perhaps only after Banh Chung, boiled chicken is always an indispensable item in Tet trays. It is believed that offering this yellow-skinned boiled chicken beautifully cut into pieces adorned with thin lime leaves will bring a good start and good luck. In particular, accompanied by a plate of boiled chicken is the lemon pepper salt, which adds a full flavour for this dish. 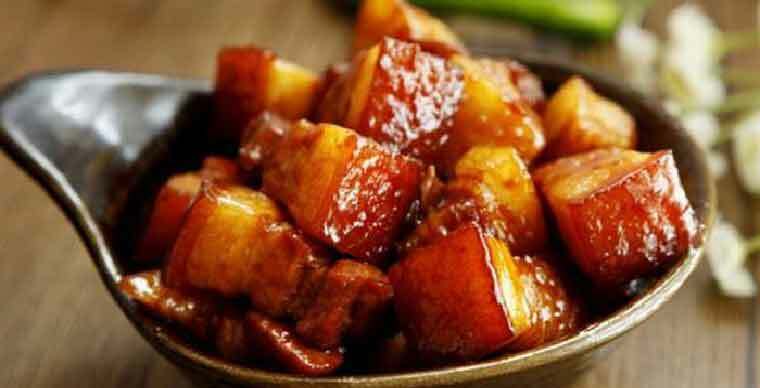 Vietnamese caramelized pork: The square piece of meat represents everything that is easy to succeed. Bamboo shoots soup: Bamboo shoots are familiar and associated with many Vietnamese people's traditions, so bamboo shoots are also a dish bearing the soul of the nation. 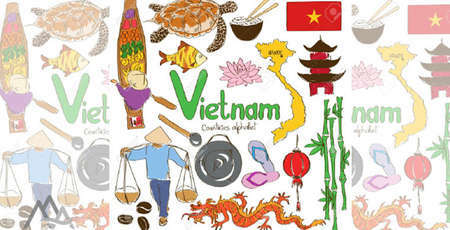 Vietnamese cuisine on Tet has many other dishes and each dish is associated with certain meanings. All of them aim to be willing for their troubles, the bad things in the old year, to quickly pass away to start a prosperous new year. Vietnamese cuisine is thought to be familiar but it turned out to be strange - strange because there are still many new things, interesting knowledge waiting for us to discover. Therefore, understanding the meaning and culinary culture of each dish is a great advantage to know the country more properly and deeply.